We all have our obsessions, our quirky little habits. I’m a list-tragic, I can’t do without them. For other people, it’s keeping their kitchen spotless, or triple-checking that the front door is locked before going out. These are the things that compel us and to at least a small degree dictate our day-to-day behaviour. For Grace Lisa Vandenburg, her obsession is counting. She lives her life counting, measuring, and timing everything. For her, counting is both a compulsion and a means of controlling her environment. In many ways her obsession both constrains her and liberates her. His intentions are pure, his heart in the right place, but as you might imagine, not all goes quite to plan. Rarely are these things that simple. This novel is quite beautiful, it’s compelling and pleasant to read. It is witty, but earnest, treating Grace’s uniqueness with the seriousness and respect that it deserves. Despite the humour used throughout the story, Grace is not trivialised. Likewise, Grace’s relationships – with her mother, her sister, her niece and Seamus are well developed and evolve throughout the novel. Interestingly, Grace is not the only one to change, far from it. Jordan makes many local references, using familiar Melbourne suburbs and recognisable streets. Sometimes I feel a little culture-cringe when writers do this, but I didn’t get this sense at all whilst reading Addition. Rather, it really endeared me to the story and the characters. I could easily imagine Grace doing yard-duty at our local primary school, and having her morning orange cake at a coffee shop just up the road from me. 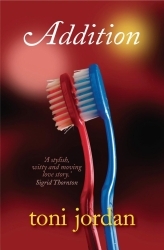 I found this novel a really quick read, it is straight forward in its language and narrative, without being flipant. The romance is lovely, and Grace is really likeable. I would recommend this as a great week-end read…best served with tea and a little peace and quiet. If you’re interested in reading this novel, pop into Kidna Books: 422 Hampton Street, Hampton or give Linda a call on 9521 8272, she’ll be able to fix you up with a copy.